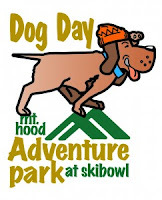 Bring your best friend (woof) up to Mt Hood on Sunday, September 18th for the 2nd annual Dog Day at the Adventure Park at Mt Hood SkiBowl. Start the day with a fun run/walk, recover with a tasty beverage in the dog-friendly beer garden, and finish that day with some laughs at the Best Pet Trick Contest. There will be three courses offered for the fun run/walk—an easy, 1-mile course great for families with kids, a moderate 2-mile round trip course, and a 7-mile extreme course for the more adventurous dogs. Registration is $15 per dog with proceeds benefiting Guide Dogs for the Blind.